I have always collected and learned how to make Easter breakfast recipes. This is the one day of the year when the holiday began with a wonderful breakfast. We would get up very early in the morning and get dressed to go to church for the sunrise service. After the service, many of the church members would come to my house for breakfast. I planned this celebration breakfast for a month before Easter. When I was learning how to make my Easter breakfast recipes, they had to be ones which could be prepared ahead of time so that I could be at the sunrise service. After the service I would rush home and have everything ready on the table waiting for my guests to arrive. This was made possible by preparing most of the food the days before Easter. All the rolls, cakes, breads, pies and other baked goods were finished up on the Saturday before Easter. I learned how to make my Easter breakfast recipes to always include one or more casserole recipes. These I would bake the night before or early in the morning while I was getting dressed for church. Anything that needed to be served hot that I cooked or baked before Sunday, I would quickly heat up on the stove, microwave or oven. Funny, how it all came together! A plate of mixed breakfast meats, sliced ham, bacon and sausages, go well with any of the Easter breakfast recipes below. All of the recipes will add to a nice buffet for your friends and family. Separate crescent rolls into triangles; place on wax paper. Place a slice of cheese over each; spread thin layer of cream cheese over slice. Divide ham evenly on each triangle; gently roll up to form a stuffed crescent. Place on lightly greased cookie sheet; bake at 375F degrees for 10 to 15 minutes until golden brown. Combine mayonnaise and mustard in a small bowl; serve sauce on the side with crescents. You and your guests will be happy if you add this apricot bread to you Easter breakfast recipes. It is fabulous! Pour warm water over dried apricots in a bowl; let soak for 30 minutes. Drain the apricots and cut apricots in strips; set aside. Combine the ¾ cup water and orange extract. Cream butter and sugar; add egg and orange mixture to creamed mixture and set aside. Sift flour, baking powder, soda and salt; gradually add to creamed mixture. 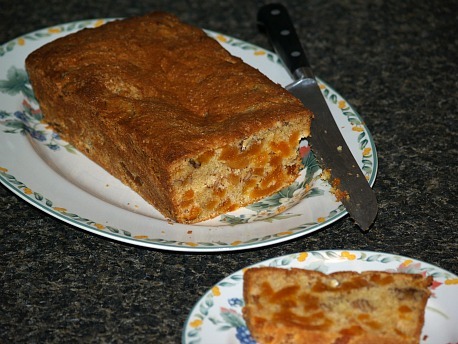 Stir in the apricots and walnuts; pour batter into greased and floured loaf pan. Bake for 90 minutes or until pick comes out clean. This is well suited to be included in your Easter breakfast recipes; the flavor is great. Preheat oven to 350F degrees; grease 9 inch pie plate. Combine eggs, onion powder, thyme, salt and pepper; beat well. Stir in potatoes, cheese, ham and green pepper; pour into prepared pan. Bake for 40 to 45 minutes or until set. Garnish with tomato slices; serves 6. Combine sour cream, sugar, orange peel and orange juice in small bowl; blend well. Add bananas and toss gently; top with granola. This is a great “make ahead” Easter breakfast recipe; prepare and put in freezer until Easter. Beat eggs slightly in mixing bowl; add milk, orange juice, orange peel, sugar, cinnamon, allspice and salt. Dip each slice of bread in egg mixture and placed on prepared cookie sheet. Cover lightly with foil and freeze 1 to 2 hours or until completely frozen. To store take from freezer and stack with wax paper between each slice. Wrap stack in foil and return to freezer. To serve preheat oven to 425F degrees. Remove desired slices from freezer, brush with melted butter, place buttered side down on cookie sheet. Bake for 10 minutes; brush top with melted butter, turn over and bake additional 5 to 10 minutes. Preheat oven to 450F degrees; lightly grease baking sheets. Sift flour and baking powder together 3 times; add sugar and salt and sift into large bowl. Stir the grated peel into dry ingredients; cut in butter until resembling coarse meal. Blend in eggs; add just enough milk to make a soft dough but not sticky. Turn dough out onto lightly floured board; roll to ½ inch thickness. Cut into 2 inch rounds with floured biscuit cutter; place on baking sheet ½ inch apart. Brush with whipping cream; bake until golden brown about 12 to 15 minutes. Serve immediately with butter, jams and marmalades.